The district of Andahuaylillas is part of the province of Quispicanchis and it is located at 3198m.a.s.l. (3100 meters) (10170 feet), The village of Andahuaylillas is about 36 km southeast of Cusco. It is located a short distance off of the main road (Highway 32N) from Cuzco to Puno. Andahuaylillas main attraction is a humble looking church, called the San Pedro de Andahuaylillas considered the "Sistine Chapel" of America due to the quality of its art pieces. Built at the beginning of VII century, the interior of the temple is decorated with murals performed by Luis Riaño ( XVII century) representing the path to glory and the path to hell. He was also said to be the author of the low borders of the wall and an important oil painting of the archangel San Miguel. Besides, this church holds a majestic piano, numerous canvases of the Academy of Cusco, silver work and baroque altars. GROUP SERVICE: Join other travellers on the tour. Our guide and transport will pick us up from our hotel to begin our tour of the Southern Valley, we will start with Tipon (approximately 40 minutes from Cuzco). Tipon was a place dedicated to religious worship and agricultural experimentation; we will visit the main plaza, the agricultural terraces, and its impressive stone water channels. Next we head towards Pikillaqta, a complex made up of the city of Pikillaqta and 23 other complexes, related for their functionality. 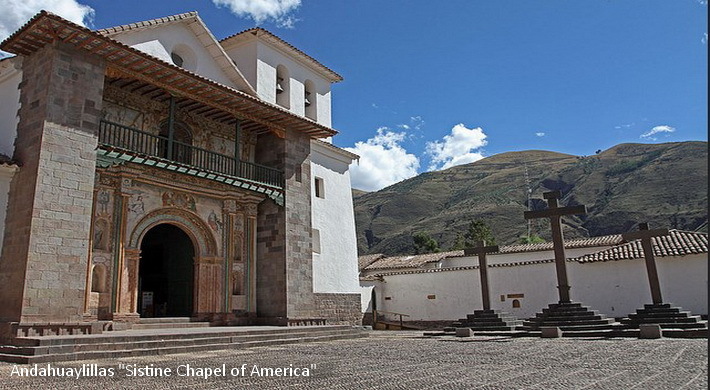 Pikillacta was constructed by the Wari culture who occupied the Cusco region before the arrival of the Inca and finally visit the church of Andahuayillas,known as the Sistine Chapel of America due to its impressive paintings and murals. Return to Cuzco and transfer to hotel. You Can Try The Famous Cusco`S Speciality "Cuy Al Horno" Roasted Guinea Pig In Tipon.